A respite from powerful winds allowed firefighters to reach 50% containment of Southern California's wildfire, but officials warned that potentially dangerous gusts would return. A respite from powerful winds allowed firefighters to reach 50 percent containment of Southern California's enormous wildfire, but officials warned that potentially dangerous gusts would return. Crews taking advantage of calm conditions were performing a controlled burn Tuesday to remove swaths of dry brush along the fire's northern edge. "We're going to take a lot of that fuel out of there," fire Capt. Rick Crawford said. "That way when the winds come back there'll be nothing left to burn." Residents near the city of Ojai could see new smoke from the controlled burn, Crawford said. Hot, gusty winds that caused a huge flare-up and forced more evacuations last weekend are expected to whip up again Wednesday. The fire northwest of Los Angeles has spread to about 423 square miles (1,095 square kilometers), making it the third biggest in the state since accurate records were kept starting in 1932. The largest, the 2003 Cedar Fire in San Diego County, burned about 427 square miles (1,105 sq. kilometers). Officials estimate that the Thomas Fire will grow to become the biggest in California history before full containment, which is expected by Jan. 7. Some evacuations were lifted Monday, and Crawford said more residents are being allowed to return Tuesday. However he cautioned that hillside homes are still threatened near the city of Santa Barbara, where firefighters mounted an aggressive air attack on stubborn flames. The fire churning through brush in Ventura and Santa Barbara counties has burned more than 1,000 structures, including at least 750 homes. Firefighter Cory Iverson, 32, died Dec. 14 of burns and smoke inhalation while battling the flames. The blaze is also blamed for the Dec. 6 death of a 70-year-old woman who died in a car crash on an evacuation route. 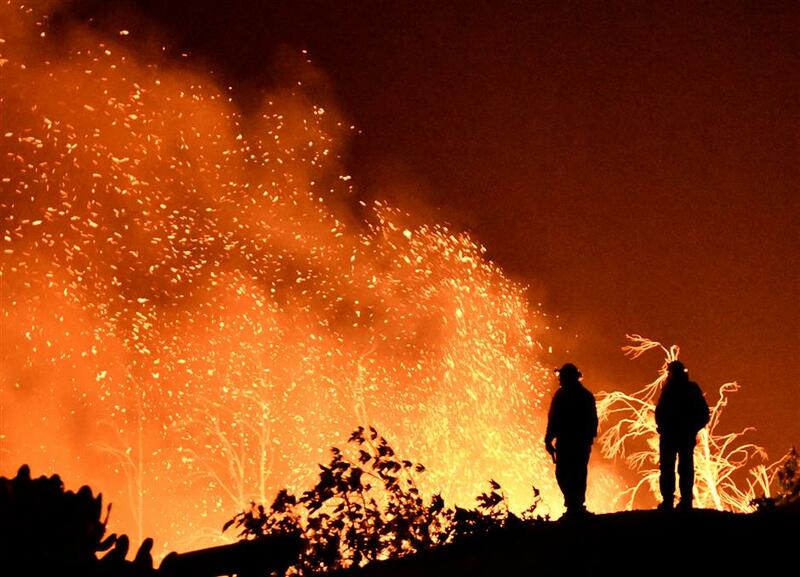 More than 8,000 firefighters from nearly a dozen states are battling the blaze. The cause remains under investigation. So far, firefighting costs have surpassed $130 million.